So finally Microsoft did a solid and realized that most of the world does not subscribe to Windows Phones and portable devices and decided to make a nice tool for their user base. However being Microsoft nothing is as easy as it seems or should be. 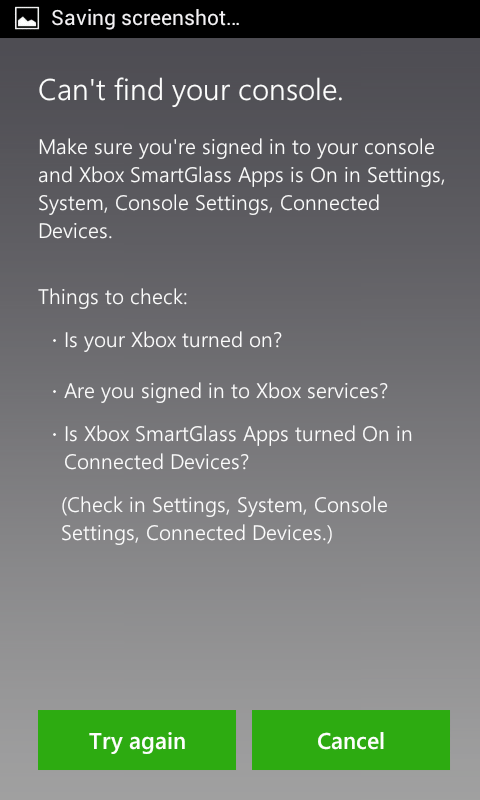 Our first impressions here is that the Xbox SmartGlass App at least for Android devices was actually pretty clunky. 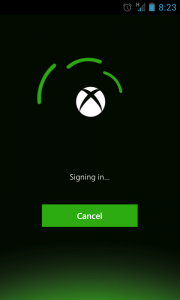 From the original demo videos floating around the interface to the Xbox doesn’t seem nearly as smooth. 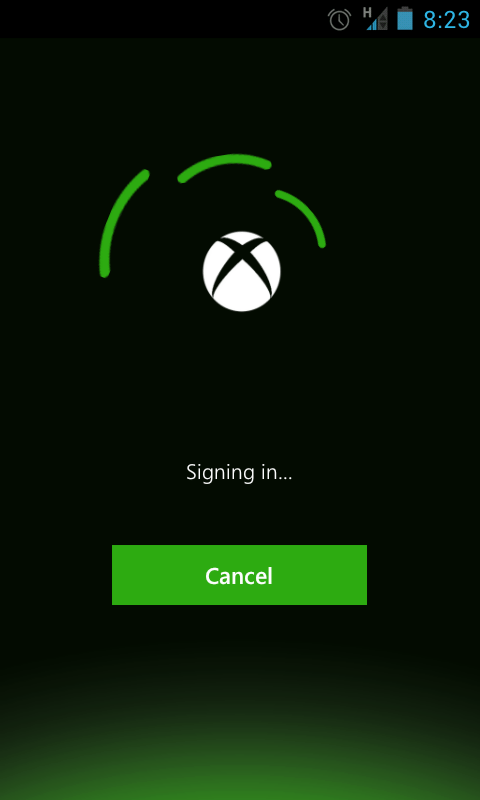 Use of your phone or tablet being a second screen that compliments your main Xbox screen isn’t really supported by much yet. 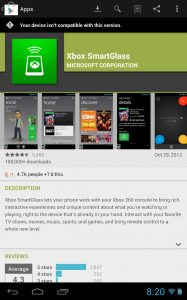 So basically your device is a remote control for the Xbox, and that isn’t even a great one. Device support is questionable. Figure one of the best selling Android devices right now is the Nexus7 tablet. 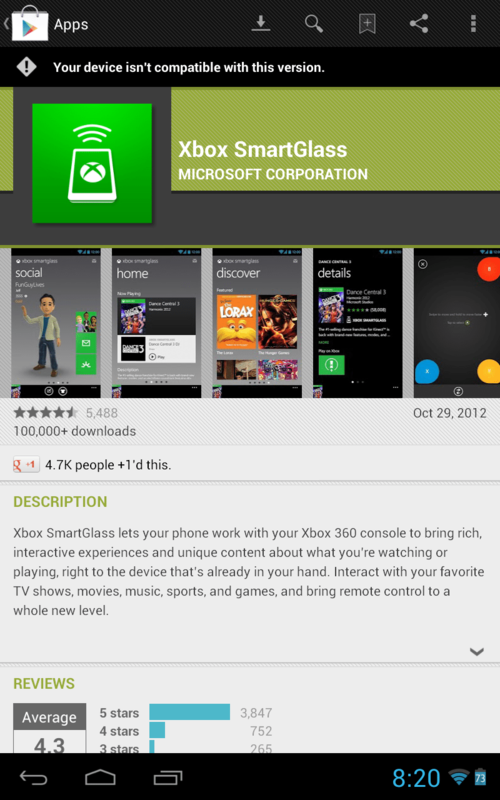 This device is not supported according to the Play store. There is a work around for this and we’ve tested it and it does work. 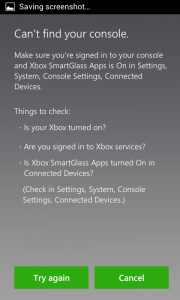 Here is some information on how to get a hack to get your Nexus 7 to use SmartGlass. Get the App here from the Play store. If you aren’t using a Nexus 7 that is.